Most dogs can swim. The best time to train a dog into a swimming pool is when they are still young and have little, or no bad experiences with the water. Forcing or throwing your dog into the swimming pool is not a good idea. It is best to let your dog does it on his will. But wait, you cannot teach your dog how to swim without a swimming pool. So, the first thing you need to do is to buy one for him. 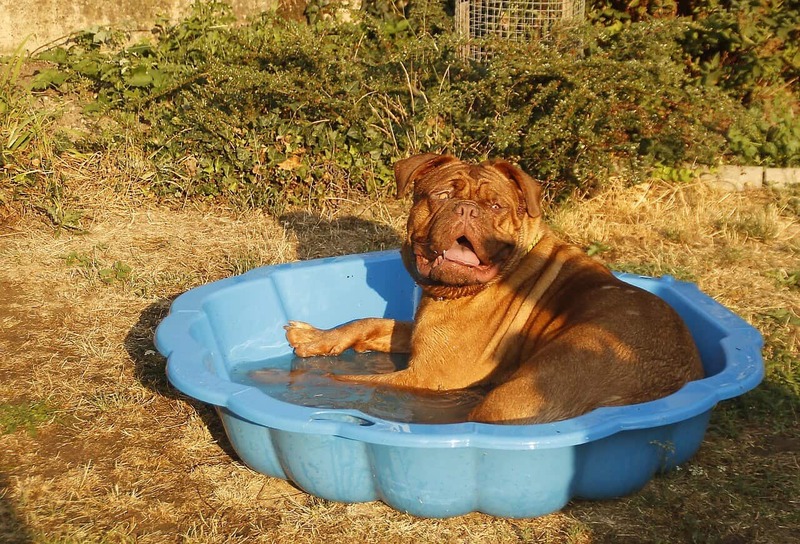 There are lots of dog swimming pools being offered both online and offline. Some may cost less and others are quite expensive. 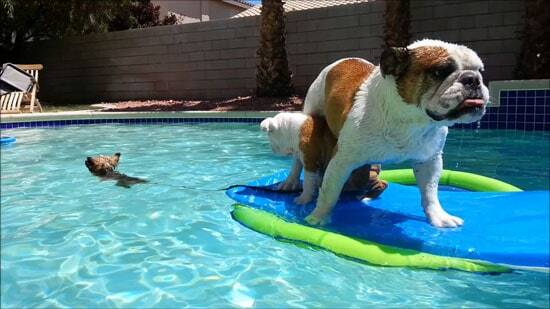 Your dog will surely love the PetEdge Guardian Dog Pool. It is perfect for small and medium sized dogs. Your little pets can swim and play around on this 7 x 32 x 8 inches swimming pool. It is very durable because it is made from long-lasting PVC so you will not have a problem in case your pet accidentally scratches the pool. When not in use, you can simply fold it and store it in a safe place. Because it is very handy, you can bring it along when you are traveling with your dog. To teach the dog how to swim, you need a swimming pool. These dog-friendly pools may look like an ordinary kiddie pool but they are designed specifically with dogs in mind. Check out the Guardian Gear Dog Pool. This pool is available in three sizes and is made from PVC material which is very durable it will last for a very long time. Setting up the pool is easy, simply lay the pool in your deck, backyard or even in your patio when your dog needs to take a dip or you can take it along with you when traveling. To empty the pool, simply open the drain which is conveniently placed at the bottom so you will not have a hard time removing the water after use. You can fold the pool and store it when not in use. During summer let your dog cool off in the Front Pet Dog Pool. Just like the first dog-friendly mentioned in this article, it is also made from sturdy PVC. It is easy to use, just fill the pool with water up to the top level and then open the drain after use to empty the pool. Storing it is not a problem at all, you can simply fold it and store or bring along when traveling together with your dog. The large size with a diameter of 50” and 1.8” deep is perfect for Labradors. The dogs can sit and walk around the pool. Other dogs would simply want to sit in the pool to cool down their body during summer days. With these products, you can let your dog stay on it for hours. You can also let your kids play with your dog while in the pool. It is the best solution to overheated dogs during summer time. These products are very convenient and at the same time durable. When you need to change the water, simply open the drain at the bottom and let the water flow freely and then you can fill it again with clean water. When not in use you can just fold it and store in a place where it is free from pointed items. These swimming pools are very tough that it can withstand the scratches and bites from your dogs. These dog swimming pools are perfect for dogs who want to keep their body wet. It offers them hours of fun not just for dogs but pet owners as well. Aside from your pet’s daily walk, this could also serve as an added routine for your dog. Teaching your dog how to swim is not an easy task, having a pool in your backyard is a good start. Remember never force your pet dog to swim, let him do it on his own and don’t forget to reward him.